Gayle Palmer qualified in 1991 from the British School of Osteopathy after four years of training and completing an extra 2,000 clinical hours. With years of training and experience, Gayle Palmer can be your teacher and will guide you through every stage of your path to extraordinary health. She only works from the Living Elements Clinic, Sidlesham, Chichester on a Monday, Tuesday and Thursday. 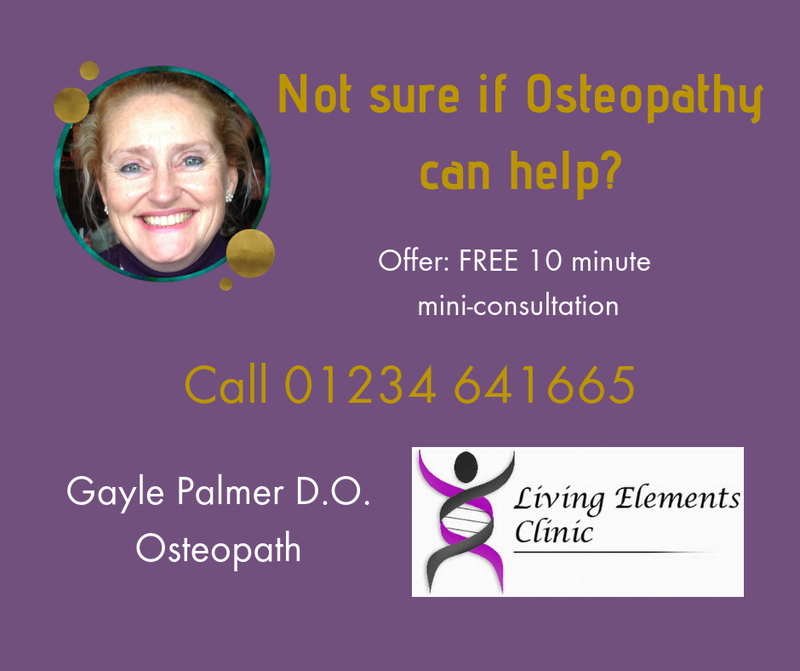 Gayle’s special interests lie in paediatrics, obstetrics and gynaecological problems and she studied and worked at the Osteopathic Centre for Children in London (Foundation for Paediatric Osteopathy) for three years on a voluntary basis in the mid 1990s. Gayle is particularly fascinated in understanding and treating people who have long-standing, chronic problems which have not been helped by other therapies, whether conventional or not. See our blog pages for various articles about these aspects of health . 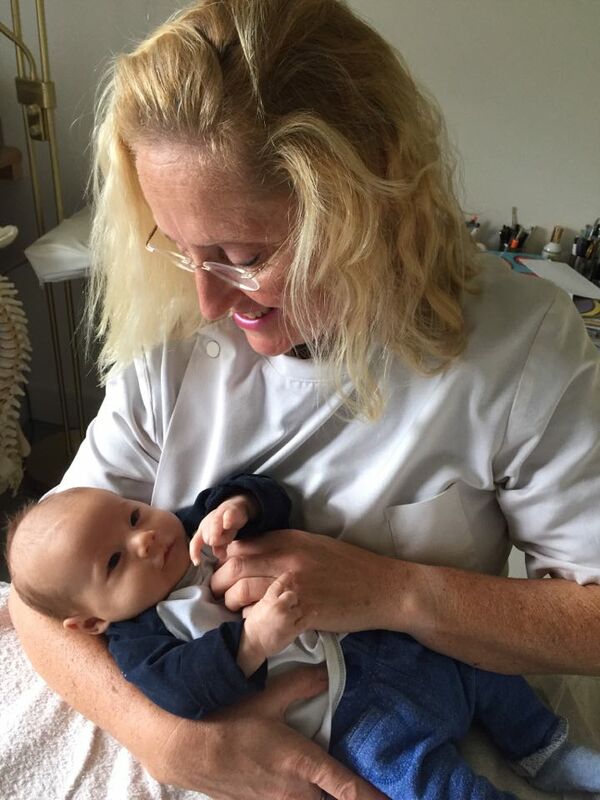 In addition I have an interest in facial and dental problems and am interested in the function and development of the face, mouth and dentition – especially useful when working with babies and children. “I am just as at home treating low back pain and sciatica, as I am a child with feeding problems or persistent crying or someone with headaches! If you think you have a challenge for me, give me a call for a free 10 minute, initial consultation and I will assess where it may lead and whether I think I can make a difference, though not a “cure”. 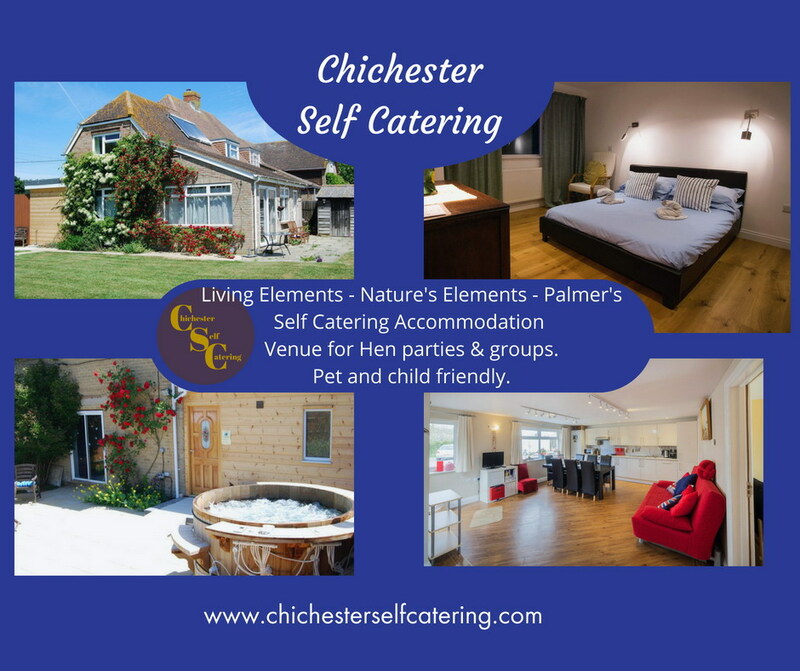 Work began on building the new Living Elements Clinic at her home in January 2004 and I am delighted to welcome you to this purpose-built, complementary health clinic in Sidlesham, near Chichester. It was opened on 21st March 2005 by the Duchess of Richmond and Gordon. The clinic receptionist is Echo the standard poodle! She is friendly and calm, and can open doors! 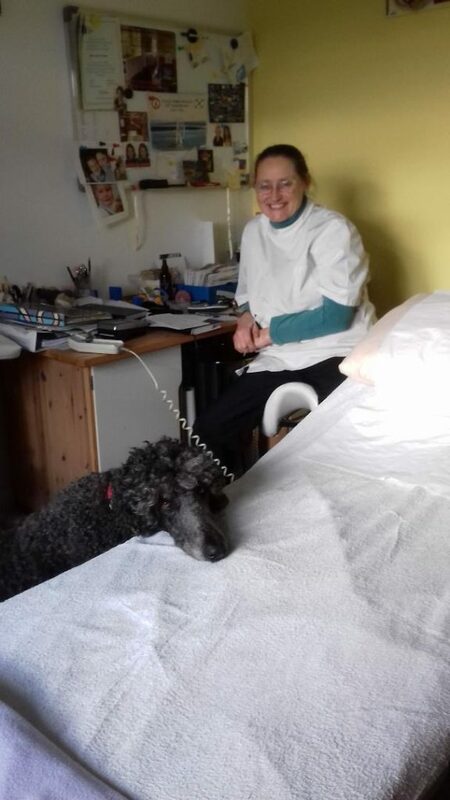 Echo the standard poodle is the clinic receptionist. Gayle offers FREE 10 minute mini-consultations to assess whether she can help you or if you would be better helped by another therapist. Please call 01243 641665 to book this. Not sure if Osteopathy can help? Speak to Gayle Palmer D.O. for free! Simply Health (formerly HSA) and more… etc. I AM NO LONGER COVERED BY BUPA OR AXA PPP, AS THEY WILL NOT REIMBURSE OUR FEES IN FULL, NOR THEY WILL NOT LET YOU TOP UP THE FEES! THEY RESTRICT THE NUMBER OF TIMES WE CAN SEE YOU AND THEY WILL INCREASE OUR ADMIN COSTS WITH THE FORM FILLING AND AUDITING. THEIR BEHAVIOUR IS COMPLETELY WITHOUT INTEGRITY FOR ME AND YOU! HUGE APOLOGIES IF YOU ARE INSURED WITH THEM, BUT WE WOULD RECOMMEND YOU CHOOSE FROM ONE OF THE ABOVE PROVIDERS IF YOU REQUIRE REGULAR COMLEMENTARY THERAPY. IF YOU CHOOSE TO LEAVE BUPA OR AXA PPP FOR THIS REASON, PLEASE TELL THEM WHY! Your health is my Priority… Place your healing in my hands. Member of the General Osteopathic Council, Member of the Institute of Osteopathy, Member of the Sutherland Society. Osteopathic fee increase from 2019..
To enable me to continue with the standards that you expect and deserve, this is a necessary action. Payment is due at the time of the treatment please by card, debit card or cheque. Hopefully online payments will also become possible. Thank you for your continuing support and trust in me. ALL missed appointments will be charged for at the discretion of the practitioner concerned and an invoice issued to that patient. The FULL FEE is chargeable. ALL appointments cancelled with less than 24 hours notice are chargeable at the full rate UNLESS the appointment is subsequently filled or in exceptional circumstances – at the discretion of the practitioner. Please understand that this is NOT a personal request or there to cause any problems, just that this is the CONTRACT. you have agreed to come to an appointment, the practitioner has agreed to see you for the stated amount of time and cost; and that there are circumstances that sometimes prevent this from happening, nonetheless, there are consequences to the actions and choices. It also means that other patients have the time (as does the practitioner) to make new arrangements and agreements with good time. This policy is not there to discriminate against you, the patient, but to ensure the easy operation of the clinic and for all the patients’ benefit in the long run. If patients do not stick to their agreements, they may have to expect that the fees as a whole will have to increase in order to pay for the missed appointments / late cancellations. Workability is essential for all. Note: The cancellation policy is written on the bottom of the appointment cards and on a notice in the reception area and in each treatment room. It is the duty of the patient to make themselves familiar with this and is in line with other health practitioners – eg dentists. INTEGRITY IS A CORNERSTONE OF THE CLINICS POLICY. In addition to all of this Gayle has also been developing a life-changing series of courses to help seniors and their families create order, direction and peace of mind into their later years, and beyond. It is called Great Guidelines for Later Life. The first course available is Freedom at the End of Life. 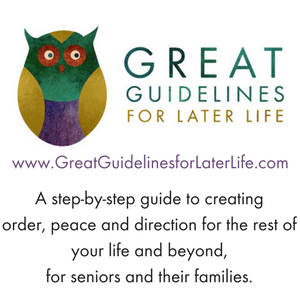 To find out more about this revolutionary guidance at having a successful later life please go to: www.greatguidelinesforlaterlife.com and be inspired at what becomes possible when the right step-by-step actions are taken. You can also download a free starter kit – that has already saved 2 lives! Gayle’s hobbies include gardening and racing and sailing her Solent Sunbeam in Chichester Harbour. If you wish to know more about this contact her directly, Gayle was the Class Captain! Come and sail from Itchenor Sailing Club and discover and share our passion! Sail a Classic Yacht – ask Gayle how and when!